Friday was a big day in São Paulo, Brazil. It was the start of Carnival — a big reason to throw a party in a country that is not shy on excuses to do so. But while the thousands filled the streets with their song and dance, another group was celebrating the day cooped up inside the liquor-free Sheraton WTC ballroom. It was Day 1a of the PokerStars.net Latin American Poker Tour Grand Final, and it drew 367 players off the streets and onto the felt. Ten levels later, that number was reduced to just about 100, and Jean Double finds himself atop the overnight chip counts with 189,400 in his bag. As is always the case, the Latin American wing of Team PokerStars Pro was well represented. Humberto Brenes came down from Central America to play, drawing the same starting table as his son, Roberto. The pair of Mexican Team Pros, Angel Guillen and Christian de León also came on down, though both of them had their tournaments cut short with early exits. From a bit further south came Argentina's Nacho Barbero and Leo Fernandez as well as Brazil's own Gualter Salles and Andre Akkari. The latter may well be the best-known poker player in this country, but he too was forced out early to leave Salles fighting the good fight for the home team. Surprisingly, though, a few notables from Europe and the North America came out to play, too. 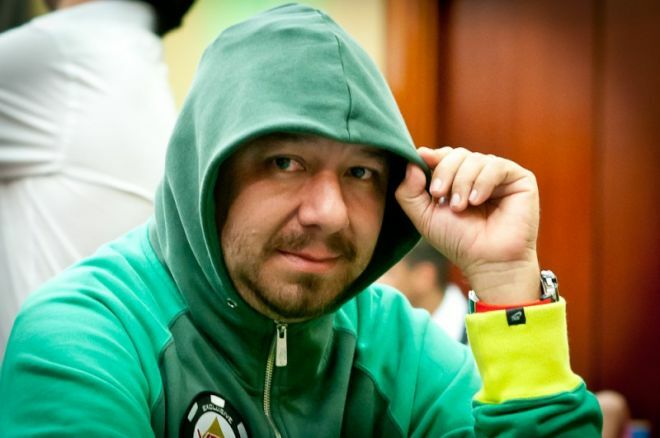 Having Daniel Negreanu in the field was a big moment for poker in Brazil, and Kid Poker worked his magic up on the featured table all day long to bag up a good stack at the end of play. He elected to sleep in a few extra hours to try and sleep the sugar cane liquor out of his system, and when he did turn up, he came ready to play. Negreanu's first order of business was to turn a full house with pocket sevens and bust an opponent who held an overpair — pocket kings. Soon thereafter, he took down pocket aces with his . The money got in after the flop, and Negreanu spiked one of his 15 outs quickly as the turn gave him the winner. A bit later on, Negreanu found aces, and Marcelo Dabus committed himself with on a jack-high flop. By the end of the day, Negreanu worked up a stack of 121,700 to put him well above the chip average and in a dangerous spot for the rest of the field. Back to the Team Pros. Eugene Katchalov is a Ukrainian living in New York, and he too made the trip across the equator for this tournament. Europeans? The LAPT was pleased to welcome Team PokerStars Pros Fatima Moreira de Melo (Holland), Matthias de Meulder (Belgium), and Juan Manuel Pastor (Spain). Unfortunately for that European trio, none of them could survive to bag up chips. While the notables were falling off the list one by one, a couple of others were making their charges. Elio Fox's main claim to fame is his victory in the 2011 World Series of Poker Europe Main Event, and he made his presence known in Brazil on Friday. Fox began the day at a tough table, but he worked his stack upward steadily until he found his windfall after the dinner break. He had already quadrupled his 20,000-chip starting stack when he raised and called a three-bet with king-queen and flopped trips. He check-called bets on the flop and the turn, then led out on the river. His opponent shoved, and Fox called with the best hand to earn the knockout and the near-double. That pot put him at nearly four times the chip average, and he coasted for the rest of the night to finish with 99,700. When it was all said and done around midnight local time, less than one-third of the starting field was still left with chips. Among those returning Saturday are a four-pack of Team PokerStars Pros — Brenes, Negreanu, Barbero, and Fernandez. They'll be part of the crowd returning to the ballroom tomorrow at 1200 BRST (1400 GMT) for another day of poker, and our Live Reporting team will be back inside the ropes to pick up the action. In the meantime, follow us on Twitter to keep up with the rest of the news from the poker world.